Coverage: Live on BBC Radio Ulster, plus live coverage on the BBC Sport website. Ireland full-back Rob Kearney is expected to be available for Sunday's World Cup game against Italy. Kearney sustained a hip injury when scoring a try in Ireland's win over Romania but scans have indicated that the ailment is not serious. Keith Earls is also in line to play against Italy despite suffering a blow to his head in Sunday's 44-10 win. Italian captain Sergio Parisse is set to play at the Olympic Stadium after recovering from a calf problem. The inspirational number eight had surgery to drain a haematoma in his calf three weeks ago and missed Italy's opening Pool D defeat by France and the narrow victory over Canada. However, the Stade Francais star joined up with the Azzurri squad on Tuesday morning to hand a major boost to coach Jacques Brunel. 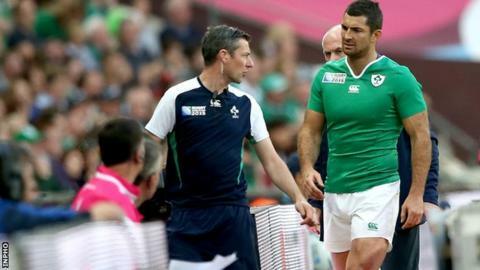 British and Irish Lions player Kearney underwent a scan on Monday and the Ireland management are confident that his "minor gluteal strain" will not rule him out of the Italy game. Kearney suffered a heavy blow to the hip in scoring Ireland's fifth try in the comfortable win over the Romanians at Wembley. Connacht centre Robbie Henshaw will train fully this week and is likely to be restored to the 12 shirt against Italy after hamstring trouble ruled him out of the World Cup's opening fortnight. Munster's Simon Zebo will rejoin the Ireland squad later on Tuesday after travelling home to Cork to attend the funeral of his grandfather. Zebo, usually a winger, performed impressively at full-back against the Romanians before Kearney came on as a second-half substitute at Wembley. Flanker Jordi Murphy suffered a leg injury in Sunday's game but is expected to resume full training before the Italy contest. Ireland will book a place in the quarter-finals if they win on Sunday.